The cornea is the transparent structure at the front of the eye that allows light to enter. Traumatic injury, most commonly a scratch, can damage the cornea and lead to corneal ulceration. 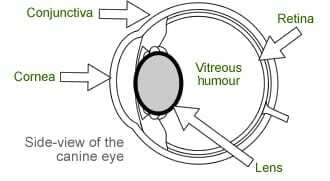 The surface of the cornea is covered by a thin layer called the epithelium, which protects the cornea and keeps it waterproof (see diagram below). An ulcer develops when part of this epithelium becomes scratched, exposing the underlying tissue. The eye becomes painful and cloudy, and the white of the eye may become reddened and inflamed. 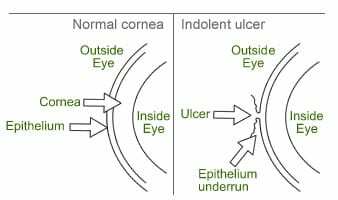 The majority of corneal ulcers will heal rapidly within a few days, as the epithelium regenerates from the edges of the ulcer and spreads across the defect. However, in some dogs this healing process does not occur and they go on to develop an ‘indolent’ corneal ulcer. This type of corneal ulcer is shallow and non-infected but simply refuses to heal. Indolent ulcers are usually quite uncomfortable and if left untreated they can persist for many months causing continuous irritation. Why does an indolent ulcer refuse to heal? The epithelium at the edge of an indolent ulcer is loose and underrun, unable to ‘stick down’ and heal the defect. For the indolent ulcer to heal, this non-adherent epithelium needs to be removed so that normal healthy epithelium can form and spread across to allow healing. How can we treat indolent ulcers? The aims of treatment are to remove the loose epithelium and to encourage newly formed epithelium to anchor to the underlying cornea. Occasionally these treatments can be performed in the conscious animal using local anaesthetic eye drops but often it is necessary to sedate the patient to avoid undue stress and inadvertent damage to the eye. Following treatment, we give a course of pain-relieving tablets and antibiotic eye drops until the ulcer heals. The eye may be a little more uncomfortable and cloudy, but this should settle over a few days. 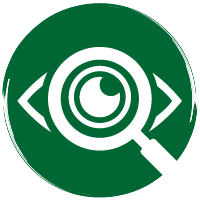 Rarely the eye may become very inflamed and reddened. If you are concerned in any way (especially if a severe discharge develops, or if the eye appears very painful) then please give us a call for advice or to arrange a check-up examination.